The Hotel is situated by the Szczecin bay, 100 m away from Yachting club neighbourhood. We offer double, triple, of four persons rooms and suites. 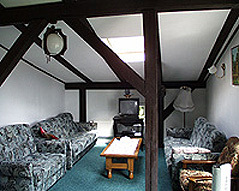 Each room is equipped with a TV SAT, a radio, a refrigerator. The suites additionally have a gas kitchen. The guests from the other rooms may use the hotel's kitchen which has a fully equipped set. Our restaurant serves delicious meals of Polish and European cuisine. To our guests disposal is a sauna and a car park. There is a possibilty to take an opportunity for a trip to the sea by ferryboat where the shop free of charge is situated. Those travelling by boat, may like to know that the hotel is just meters away from the marina, and approachable both by the Odra river from the South, and the Bay of Swinoujscie from the North." Pets are allowed. Trzebiez is situated amidst forest on the west side of Szczecin reservoir, 25 km away from the sea.